If you have a need to print variable information in line with your existing web presses, then our hybrid inkjet towers may be your answer. 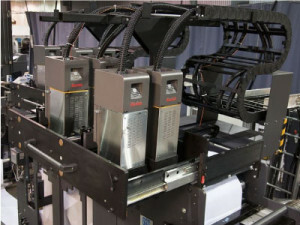 These towers can be configured to print variable monochrome or process color inkjet at press speeds. Most inkjet heads can only print 4.25” wide text or images. They are typically used for addressing direct mail documents. Our towers provide the mounting for the inkjet heads, but in addition we offer drying, web tension control, and camera verification systems. They are typically installed after the last print unit and prior to any finishing stations. 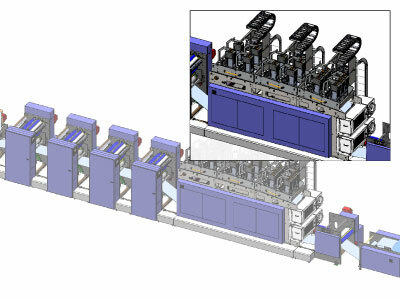 They can be place above the press on a mezzanine, at right angles to the press, or the press can be modified to incorporate the inkjet tower inline.  GSS has experience with a variety of press configurations.